I once came across and article in a scrapbook magazine with a survey to determine whether the reader was a scrapbooker or a collector of scrapbook supplies. This may seem amusing to some but there is an fine edge that one can easily slip over when at the height of a crafting obsession. This applies to all crafts and hobbies, woodworking, quilting, knitting, beading, model making… the list goes on. So beware and try to put a limit on the amount of supplies you allow yourself to amass. It is very easy to get carried away. Tastes change, trends change and life changes and one day you may get board with the current hobby, become unable to continue the craft for physical reasons or change your lifestyle and be unable to accommodate your hobby. Then you are left with a huge collection of supplies to get rid of and the guilt trip that goes along with that because of the amount of money you have spent on something you no longer obsess over. For Example, I used to do a lot of scrapbooking and papercrafting and although I still use my supplies I don’t use them nearly as much as I once did and they take up a lot of space in my craft room and I am now more interested in beaded jewellery making. I am slowly using up my supplies but if you think you won’t, don’t despair, try selling them on eBay, or to a friend who still enjoys the hobby or there is sure to be a craft group around who would be happy to take them off you hands. 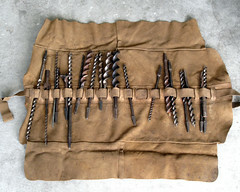 Today’s item is a old set of drill bits that belonged to my husband’s grandfather. He sold them on eBay to someone who will get new joy out of them I hope. 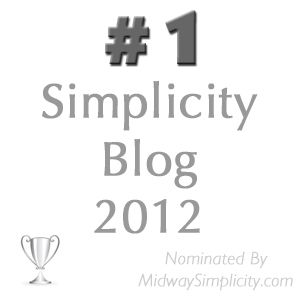 I just recently found your blog and am enjoying reading your posts. This one could be written about me. I like making cards and still do all of them for friends and family but it’s amazing how fast and furious my purchases were in the beginning. When our income was reduced I stopped buying and it’s amazing that I haven’t missed adding to my collection! I need to convince myself that it’s ok to get rid of cross-stitch supplies – I haven’t done that craft in YEARS! I hear you about the card making supplies. My problem was that I worked for Jo-anns in the US and papercraft shop before that. I think I will be a long time using up my supplies but my son has just started a Fine Arts degree in college so maybe he will help. As for the cross-stitch supplies I have a little of that too but it really doesn’t take up much room and I seem to go back to it every now and again, so there are a lot of things I will weed out before I bother with that. I used to paint. Not canvas, but plaster figures. At first they look lovely but, boy do they gather dust. Eventually I had children and the time for the hobby vanished, for I also work. I had lots of suplies and pieces I never got around to doing. Eventually I found someone that did have the same hobby, but didn’t have the money for supplies, and it was Bye Bye stuff. Never getting caught in that again. Loved your post. Encouraged me to keep in my life important things that I have time to achieve. welcome to 365lessthings and thank you for taking the time to leave a comment. We always appreciate a new voice added to our community. I was certainly speaking from experience when I wrote that post. I am slowly dwindling down my craft supplies and having fun doing so. Stay tuned for the opening of my etsy shop sometime in the near future. I have also given my mother-in-law some of my paper-crafting supplies and intend to have a sale day at a local craft group which I really need to do something about. Good luck with your decluttering and I hope to hear from you on a regular basis. I have this awful perfectionistic tendency to purchase art supplies and then not want to “waste” them on a project that may not be “good” enough. Isn’t that ridiculous? I think it comes from that sense of money shortage in childhood, where you couldn’t just go out and buy more like an adult can. I’m thinking about Etsy myself — I would like to start woodworking, but I don’t want a bunch of projects to clutter up my life while I’m learning. I have a friend who wanted to try scrapbooking but she couldn’t get past the idea that she might cut the paper wrong and waste it. Needless to say she isn’t having a problem decluttering craft supplies. I on the other enjoyed scrapbooking for some time but now I just make cards occasionally and have far too many supplies. They are slowly being given away, sold and used.